This is the fourth post in a series which compares the skills required to play chess with the skills required by business analysis practitioners. Each of the posts has used one of the BABOK knowledge areas as a framework for the comparison, this time looking at the knowledge area of Enterprise Analysis. A business analyst working with this knowledge area needs to operate at the level of the whole enterprise. Bloom's taxonomy of the cognitive domain, might describe this kind of thinking as evaluation. This knowledge area is all about taking a systems view, understanding the business environment and the things which impact and influence it, then developing, describing and implementing solutions which meet the needs of the whole enterprise. Enterprise analysis requires the business analyst to understand the complex interaction between dependencies and constraints at the organisational level and to be able to see opportunities and challenges from the perspective of the enterprise. 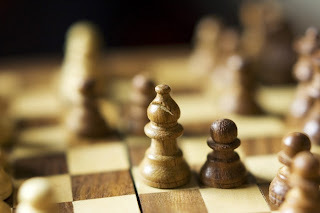 In the game of chess, the enterprise is represented by the whole board, not just the particular focus of play; the rules of the game represent dependencies and constraints, and like the constraints and dependencies which impact many projects, they are, for the most part immutable. Yet in both environments the possible paths forward are multitude. Whilst you can identify (what appears to be) your opponents next best move and act or respond accordingly, but you cannot assume they are seeing the game from the same perspective. For a business analyst key skills for enterprise analysis are the ability to synthesise and analyse large amounts of complex information and then to use the results of that analysis to assist the business to define, elaborate and prioritise its requirements in accordance with (what the evidence suggests to be) the next best move and in the best interests of all stakeholder groups. Chess teaches you to constantly re-evaluate the state of the whole game; every move changes the possibilities for the next. Your plans must be reviewed and re-prioritised in response to each action taking into consideration that your opponent is doing exactly the same thing. Assumptions in chess, as in business are ill advised, you must assume that all risks will become issues and plan to play accordingly. This gives your risk and issue management skills a free workout.